As speaker after speaker made clear at its annual report-back meeting, held on 26 November, UCT is a major stakeholder in the operations of the Groote Schuur Community Improvement District (GSCID) and Residential Security Initiative (RSI). Notably Anthony Davies, GSCID CEO, and Western Cape Premier Helen Zille hailed the university for taking the lead in these initiatives, particularly in the establishment of the GSCID and its funding of the RSI. Davies highlighted the university’s role in the GSCID’s attempts to tackle “crime and grime” in the area. 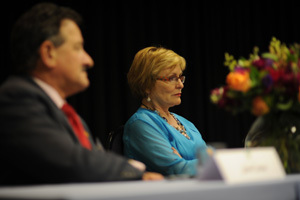 In turn, Zille thanked UCT for being a “catalytic player” in the makeover of Rondebosch and Observatory. But UCT is by no way the only key player in the initiatives. Over the past two years, since its establishment, both have been recording major successes through its partners. The organisation Straatwerk, a faith-based organisation that operates a ministry to the destitute and previously unemployable, has helped create jobs for 61 homeless people, thanks in large part to the tireless labours of Hannes Van Der Merwe of Straatwerk and social outreach manager, Ingrid Frieslaar. The GSCID has also joined forces with the Observatory Improvement District (OBSID) – in which UCT also plays a part – sharing a radio frequency and management structure. Through support of local businesses, the GSCID revamped the iconic Rondebosch Fountain, even getting the light to work on what is said to have been, with its installation in 1891, the first electric street light in the Cape Peninsula. There were also growing collaborations with the South African Police Service, the provincial government, and a number of local residential and business associations. And finally, international security company Securitas has brought its expertise on board through its acquisition of Orbis Security Solutions, the dedicated security provider for both the GSCID and OBSID. As a whole, the two initiatives show exactly what can happen when the citizenry play its part, said GSCID Neil Fraser.